Even his waxwork is full of charisma. Is the Premier League ready for Zlatan Ibrahimovic? He scores goals by the hatful, he makes headlines like almost nobody else - and now he says he is finally coming to the Premier League with Manchester United. From his records to his skills, from stealing bikes to putting his country on the map, how much do you really know about Zlatan Ibrahimovic? Or lack of. It has to be. It's an easy warm-up for our list - but forgive us, it sets the tone. When asked by Arsenal to go for a trial in 2000, his response was unequivocal: "No way. Zlatan doesn't do auditions." You might have guessed it, but Zlatan was a lively youngster. He regularly stole bikes so he could get to training with the Malmo youth team. You can even buy "Zlatan: The Bicycle Thief" T-shirts. We don't condone it, kids.. Ordered by his Barcelona manager Pep Guardiola to comply with a club rule to "only" drive an Audi to training, Ibrahimovic didn't fancy playing ball. He turned up in his Ferrari Enzo. "It caused a scene." Ibrahimovic can speak fluent Swedish, Bosnian, English, Spanish and Italian. As a polyglot, he puts his skills to good use - he abuses French refs in English, so they don't know what he's saying. During his spell at Barcelona, Ibrahimovic claimed the Spanish giants didn't know how to use him. They were treating him like a family car, not a sports car. "When you buy me, you are buying a Ferrari. If you drive a Ferrari you put premium fuel in the tank, you drive onto the motorway and you floor the accelerator," he said. "Pep Guardiola filled up with diesel and went for a spin in the countryside. If that's what he wanted, he should have bought himself a Fiat from the start." Ibrahimovic and Guardiola don't get on. They had a huge screaming match during the Swede's last match at Barcelona. Guardiola won that one, and Zlatan departed the Nou Camp. They'll meet again when the Manchester teams meet in China later in July. "I put Sweden on the map," he said. "People know what Sweden is because of me now. The way that I opened the door for the young people that come from where I come from and that have a different background, that is what I want to be remembered for." Sorry to disappoint, but in his 2015 autobiography "I Am Zlatan", large parts of the book weren't his actual quotes at all. "I don't think I have any real quotes from him," his ghostwriter admitted after it was published. 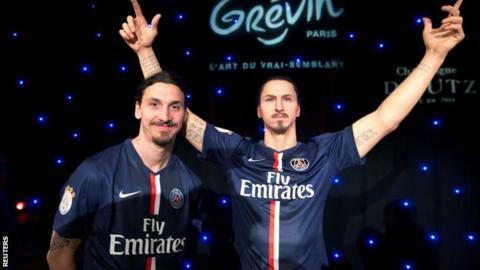 When he does finally retire, Ibrahimovic won't be short of offers of employment. However, he does have some more unusual plans - to get ringside and hit the scorecards. "I am a black belt in taekwondo," he said. "I have been asked to judge in competitions around the world but, because of football, I have not been able to. When I retire that would interest me." Ibrahimovic will no doubt pocket a decent signing-on fee at Old Trafford. But how about making him a monarch? King Zlatan of Manchester? Eric Cantona may have had a word. The Swede would have been a royal though, had he taken up the offer to join Rot-Weiss Oberhausen, a fourth-tier club in Germany. That's what the club claimed, at any rate. The move may make sense in the boardroom. How about on the pitch? He's not shy in coming forward on this one, so this is hardly a surprising quote. "We usually say you cannot become a legend before death. But I am a living legend." He also rolled out the 'L word' when he announced he was leaving Paris St-Germain. Unlike Guardiola, Jose Mourinho and Ibrahimovic like each other. A lot. "From being a cat, I felt like a lion," said the striker. "I felt like the Terminator." And on it goes. Prepare for a love-in of the highest order. It'll be quotable too. Forget the bogeyman, that's not what keeps Ibrahimovic awake. Former Juventus team-mate Adrian Mutu recalls one night when they were room sharing. "Adi wake up," Ibrahimovic said. "I had a nightmare. I dreamed Ronaldo was better than me!" He would only go back to sleep when Mutu reassured him: "You are the best in the world! Calm down!" He's had a long career but Ibrahimovic is showing no signs of slowing down just yet, scoring 38 goals in 31 league games last season for PSG. That is what United are now they've signed Ibrahimovic for free. According to one expert, his signing could be worth as much as £50m to the club. That's a lot of Zs in the club shop. Ibrahimovic has added two major records to his lengthy CV. First, he became Sweden's record goalscorer, moving past Sven Rydell's long-standing tally of 49. He eventually retired at the end of the Euro 2016 campaign on 62 goals in 116 caps. Only the Republic of Ireland's Robbie Keane (67) has more among current internationals. More impressively, perhaps, is the fact that Ibrahimovic is PSG's record goalscorer, despite only moving to the French capital in 2012. He leaves with 156 goals in all competitions, blitzing Pauleta's previous best of 109. In 2014, the Swedish Postal Service issued Ibrahimovic stamps. Of course they did. Dubbed "Zlamps", they were a huge hit and five million were pre-ordered before they were even launched. Dear Zlatan, love Zlatan. The Swede was "born to play for United", so says Old Trafford goalkeeping great Peter Schmeichel, who believes he could be like Eric Cantona. Collar up, collar down? Big decision. And so it goes on, it's Guardiola v Ibrahimovic again. According to one of Barcelona's vice-presidents Carles Vilarrubi, the striker threatened to beat Guardiola up "in front of the press" unless he was allowed to leave the club. He didn't last much longer. W is for what's the Europa League? Thursday nights in the Europa League are going to be something new for Ibrahimovic to enjoy/endure for Manchester United this season. He had played in the Champions League every season since 2002, scoring 48 times. Only six players have scored more. Let's be honest, he can afford it, but it was still a nice gesture when Ibrahimovic got all of his PSG team-mates a new Xbox One console before the machine was even released. They even came with each player's name and squad number etched on the top. He's a YouTube sensation. Of course he is. A song made in his name by Sanjin and Youthman (don't ask) has had five million views. We take no responsibility for your enjoyment, or otherwise of this video. It's got chickens, a horse and a mouth organ. No, really. If you're a world-class superstar, sometimes you can't trust the media to get your point across. Not a problem when you are Ibrahimovic - just interview yourself. That's what the Swede did before PSG's Champions League tie with Manchester City last season. He also did it before the Euro 2016 group match against Italy.